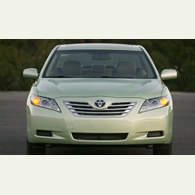 (autoinsidernews) Toyota Motor announced last Friday that beginning in November the 2007 Camry Hybrid will receive a $300 increase in its retail price, up to a base MSRP of $26,200. The price increase will affect vehicles produced in the U.S. on or after November 1 or that arrived in the U.S. on or after on October 30, reports Trend. Toyota didn't provide any reason for the change, but with the reduction in federal tax breaks on all Toyota hybrid, which took effect yesterday (October 1) the Camry Hybrid has become a lot less affordable.